Dry, chapped hands are a real problem to anyone who enjoys the outdoors or does heavy housework. One solution is to use udder cream or Bag Balm. Many perfectly polished beauties swear by traditional petroleum jelly as a protection. Place the broken pieces of solid ingredients in separate jars and heat them in a pan of water, simmering until they have melted. Measure the melted ingredients into a heat resistant basin over a pan of simmering water. Mix thoroughly. Place basin in a shallow dish of cold water and continue beating. Transfer the cream into screw top jars. This cream will set fairly solid when cold. You will need something to transfer it from the jar to your hands. The cream will melt in your hands when application starts. During the winter season in most climates, heat is turned on and indoor humidity is very low. A few hand washings with soap and water during the day and you can easily develop hand problems. The best treatment involves minimizing exposure to soap by using a non-soap cleanser. After hands have been exposed to water, apply a moisturizing lotion or cream. Better than lotion, mashed potatoes will solve this frequent problem. Boil a small peeled potato until soft. Mash with 1-tablespoon olive oil. Apply to hands and leave on for 15 minutes. Rinse with cool water. Yellowing of the nails could be caused by not using a base coat underneath your polish, or it could be a more serious nail fungus that needs to be treated. Lighten discolored nails with a whitening scrub containing a mild abrasive, or with a remover containing a lemon juice-like ingredient that bleaches out the yellow. To prevent the discoloration that occurs with nail polish stains, always use a base coat of superior quality. Ridges on the nail are, unfortunately, mostly genetic. However, if you have recently developed ridges, this could be a sign of anemia, and you should consult your doctor. Ridges may also be caused by too much pressure and pushing during your manicure. Ridges can appear either vertically or horizontally. Horizontal ridges called Beau`s lines can result from severe stress. Though you can`t change heredity, you can smooth the ridged nail surface with a buffer and buffing cream. When grooming your nails, always make an effort to be gentle on them so that they will grow back normally. A blow to the nail can cause white spots on the nail. It can happen generally, while applying too much pressure on the nail matrix during a manicure or too much pressure and pushing on the nail. Let the spots grow out, and make an effort to be gentle when manicuring your nails since prodding beneath the cuticles, where new growth is generated, can cause these spots. Although pale nails can be hereditary, more often it is the result of poor circulation or anemia. 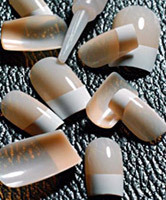 The nail beds become opaque, often leaving only a rim of pink nail bed at the top of the nail. The thumb and index nails bilaterally are the most involved. Take an iron supplement or add iron-rich foods to your diet. Fingernails are simply another form of skin. They compose of, a primarily hardened protein called keratin. Illness, overuse of harsh detergents, nail glue and acetone remover, faulty filing, too much exposure to water are basic causes peeling of the nails. Avoid quick-dry polishes that contain acetone, which can dry out your nails. A better treatment to ensure healthy and strong nails is to rub hand cream and nail oil into the cuticles and base of the nails after every time you wash your hands. Always file nails lightly, just enough to shape and keep the layers even. Uneven nails have a tendency to peel. Protect your nails from water. Wear cotton-lined, rubber gloves when doing household chores, such as washing dishes. Between uses, turn rubber gloves inside out to dry to prevent germs from growing in them. Apply moisturizing lotion to your nails, especially the skin around the nail, after exposure to water. Even a minor cut alongside your nail can allow bacteria or fungi to enter and cause an infection. Wear gloves in cold weather and during activities that might harm nails, such as gardening. Keep your nails short to prevent breakage. Trim your nails only when they`re well hydrated so they`ll be less brittle when clipping. File nails in only one direction - not back and forth, which also can split nails. Moisturize your nails after using nail polish remover, which dries your nails. Look for an acetone-free formulation. Don`t push back or cut the cuticles, which protect new nail growth. Don`t pick at hangnails. Instead, clip them close to the skin surface with sharp, clean cuticle scissors. Sun exposure, a poor diet or the prolonged use of commercial nail hardeners can cause brittle nails. Avoid the use of hardeners containing formaldehyde, which has a drying effect on nails, and try using a waterproof coating that seals moisture in the nail and repels water and dirt. Believe it or not, a waxy lip balm can be quite effective at softening nails. Moisturize with an oil or emollient. There are several on the market, but a vitamin E capsule works just as well. After a day or two, polished nails tend to look a bit dull. Hoof Lacquer, the secret weapon of manicurists, keeps nails looking like new. Purchase this product in your local equestrian shop. Massage a drop of castor oil onto each nail and buff excess away with a tissue. Your nails will have an all-natural high gloss without polish. Although artificial nails can make your hands look more attractive; they can seriously damage your own nails. Acrylic nails are the strongest and last the longest of all the nail overlays. The acrylic nails can cause little weakening to the nail plate. Women choose acrylic nails as it is the most commonly used artificial nail; Besides, if you travel a great deal, it will be easier for you to find a place to repair or fill in your manicure. If applied and removed correctly, artificial nails do little damage to your nails, but they won`t improve your nails or make them healthier cautions. The worst offenders are the stick-on variety, which cause some of the nail surface to get torn away when they are removed. Another problem is the glue, which can cause an allergic reaction. If water gets trapped under the fake nail, your real nail can turn green, and a fungal infection can set in. You need to maintain a regular visit to manicurist if you decide upon artificial nails.